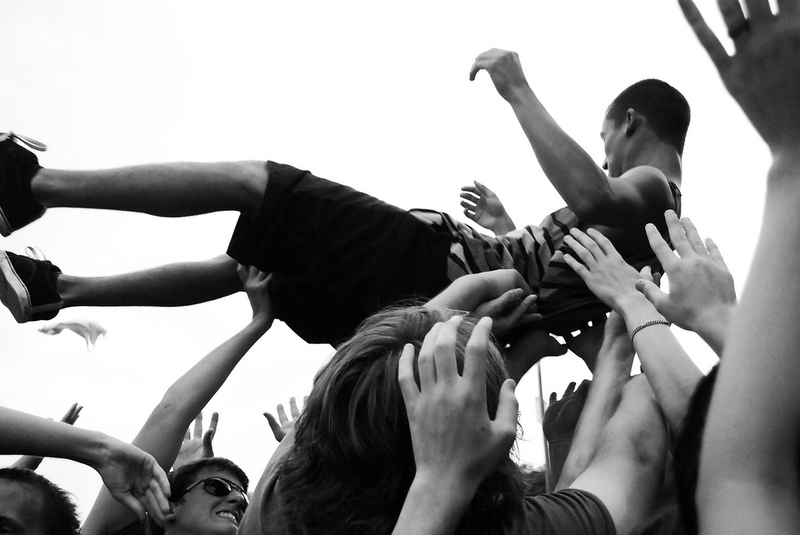 Maybe I crowd surfed too much back in the day (tip for beginners: always make eye contact with the crowd before you jump), but to me, the best part of a concert was being up close and personal with the band. Getting backstage? Heaven. It was still all about the music and the people you went with, but as for the experience,—well, more intimate was mo’ better. When I was in my teens I went to the first Lollapalooza. In my twenties, I went to many festivals. Some on farms, some in amphitheaters, one on a Native American reservation, one at an airfield, and a few more that are a bit hazy. They were sweaty, messy affairs that, while cherished, were not something I looked to replicate as I got older. But like most people, I still love live music. And in a millennium where experience is the new luxury product, concerts are shiny, beloved memories in my mental treasure chest of favorite things. I think that’s why it was so easy to get fired up for the concept of Music With Friends. It’s a club centered on intimate concerts combined with pre-show parties and afterparties. 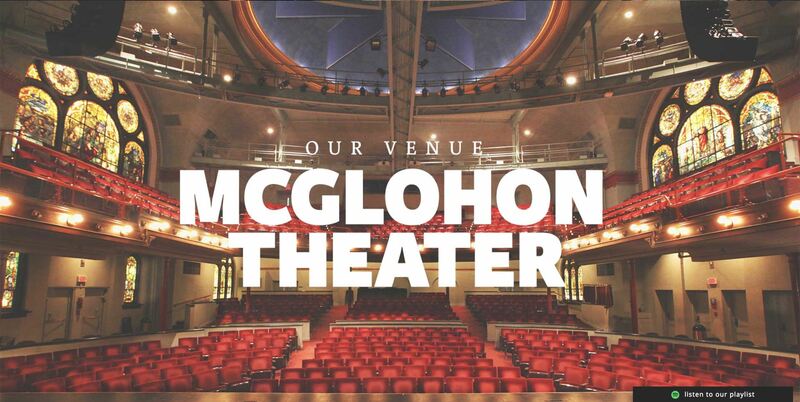 In multiple cities, the clubs select acoustically and aesthetically superb small venues for their shows, like the McGlohon Theater here in Charlotte (a converted old church). As their advertising partner, though, the sell is a bit tricky. We need to promote a year’s worth of experiences at a premium price, before any actual bands/shows have been announced. In a large way, we are holding up the vision of the club, the irreplaceable social experience with like-minded music lovers and friends, and the strength of past performances and events. Naturally it all started with their website. 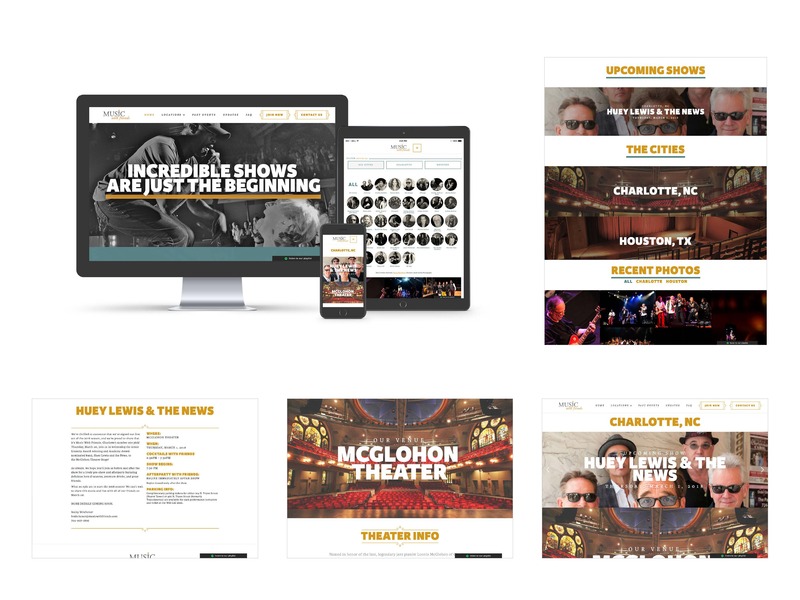 Show business is a fast moving world, so Music With Friends needed the ability to update the site frequently. We’re not in the business of nickel and dime-ing our clients for web updates, so we try to value engineer ahead of time, building functionality into websites so clients are empowered to do as much as they want to do, without additional delay or costs. 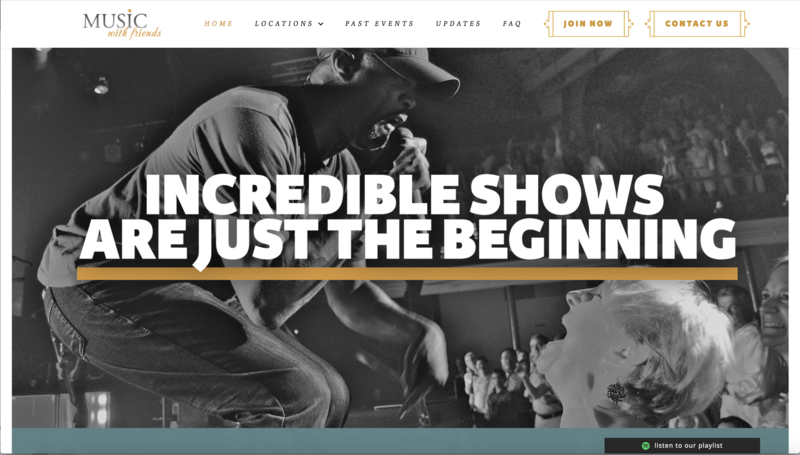 Clearly, there are shows to be promoted and news to be delivered, so our new site offered several ways for our client to enter in key information to get the word out in a clean, exciting layout that provides opportunities for personalized, one of a kind messaging, but also still deliver a consistent brand experience. We created multiple touch points for lead generation, with actionable information relayed to their sales team. Finally, we also wanted to hold up for the world the photographs of our events and the music of the artists, so prospective members could picture themselves in some of the coolest venues watching music legends, surrounded by friends. Visitors can see and almost feel how close this membership gets you to legendary artists and the energy that creates. We used all the tools at our disposal from photography to progressive design to try to convey the incredibly awesome feeling you get at this kind of music experience and event. And of course, we wanted to have music so we built in a Spotify playlist to celebrate upcoming artists and past artists alike.